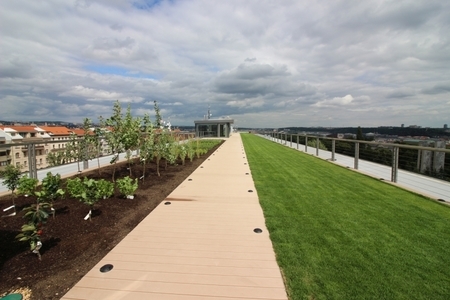 The roof garden of the Prague branch of the National Museum of Agriculture is a unique concept. The exhibition Views of Life offers bee hives, herb beds, fruit trees and bushes, and lawns for sitting on or for a picnic. And an unforgettable view of Prague. The view from the roof of the National Museum of Agriculture aspires to be one of the most beautiful and attractive in the entire capital city, because you can take in all of the most significant sites from Prague’s past and present at once. The view of the city also evokes a range of questions. What would life in the city be like without agriculture? It is estimated that by 2030, almost 60% of the world’s population will live in towns and cities. Will agriculture also be relocated here? Will vertical farming be more efficient than agricultural fields? Will we stop associating agriculture with the countryside? The museum’s roof garden can be accessed by stairs or you can take the lift.